procedures. Your role with this group ranges from keeping an adequate number of rotary instruments in the treatment room to changing them in the handpiece. Rotary instruments, such as burs, have three basic parts: head, neck, and shank (fig. 11-12). The head of the bur is the working or cutting portion, which is made in many sizes and shapes. The neck, which is the narrow portion of the bur connects the shank and the head. The part of the bur that fits into the handpiece is the shank. The length of the shank depends on the specific use of the bur, whereas the shape of the shank is designed to fit into a specific handpiece. We have already discussed the several types of handpieces used in dentistry. Each rotary instrument is used in a particular handpiece. 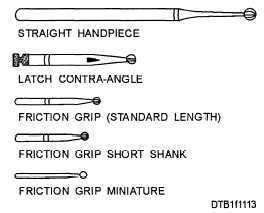 To indicate in which handpiece the rotary instruments function, they have been classed as friction grip, straight handpiece, or latch contra-angle handpiece types (fig. 11-13). The friction grip (FG) instruments are abbreviated as FG and are used in high-speed handpieces and friction grip low-speed contra-angles. These burs have small, smooth shanks that are held in the handpiece by friction against a metal or plastic chuck, or by a wrench-tightened metal chuck. Friction grip burs are available in short shank and miniature (pediatric), as well as the commonly used standard length. Figure 11-12. - Bur parts and basic shank designs. The straight handpiece rotary instruments are abbreviated as (SHP) . They are used in electric straight handpieces and in slow-speed, air driven straight handpieces. The shank on the straight handpiece instruments is larger in diameter than the FG shank and at least twice as long. The latch contra-angle handpiece instrument is identified as angled handpiece (AHP) or latch-angle (LA). This instrument is used in conventional latch contra-angle handpieces. Common AHP rotary instruments have a notched shanked with the same diameter as the SHP instruments but are about half the length. However, some AHP instruments are made with short or long shanks. Dental burs are available in many shapes and sizes. The basic shapes of bur heads are the round, inverted, pear-shaped, end and side cutting, straight/tapered plain fissure, and tapered/straight crosscut fissure as shown in figure 11-14. Burs are made of either steel or carbide. Steel burs are used in the slow-speed handpiece and dull after only one use when cutting enamel of teeth and should be discarded after use or when directed by the dentist. Steel burs being used on dentin under slow-speed often generate heat in the tissue of the tooth, causing discomfort to the patient. The dentist will use the very lowest speed to reduce the chance of heat and discomfort. High-speed handpieces use a carbide bur. Because of its hardness, the carbide bur can be used many times to cut hard enamel tooth structure without becoming dull. However, carbide burs are brittle and have a tendency to fracture under pressure. The carbide bur operates most efficiently at high speeds with light pressure. Several pieces of equipment are commonly used in many dental specialties. These items include provider and assistant mobile chairs, amalgamators, and visible light curing units.